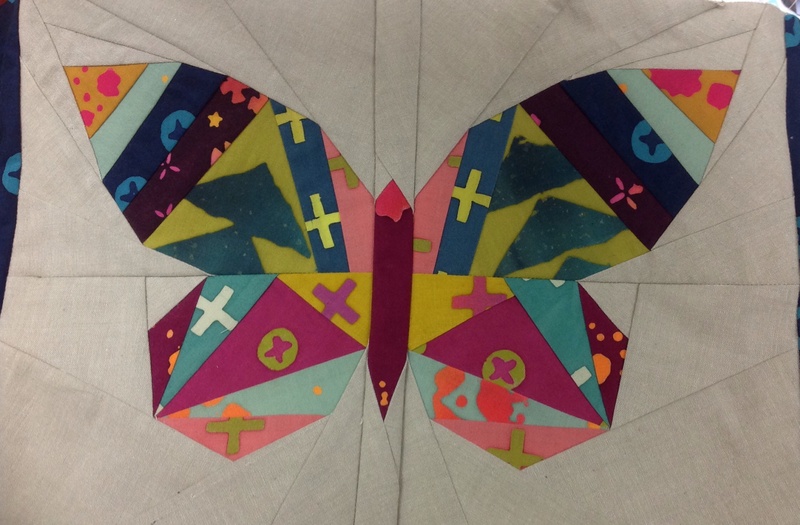 After seeing the ‘My Small World’ Quilt project in Quilt Mania and on the verykerryberry blog thought it would be a good pieced project to do. Generally I prefer appliqué but like to diversify a little. Also I thought it would be an interesting project to show the Apatcheez, especially those doing the beginner sampler quilt. It was rather tricky finding additional copies of the magazine, however, there are now several of us underway (or at least the project now appears on serval UFO lists). I’ll keep you up to date with the progress as we go along. 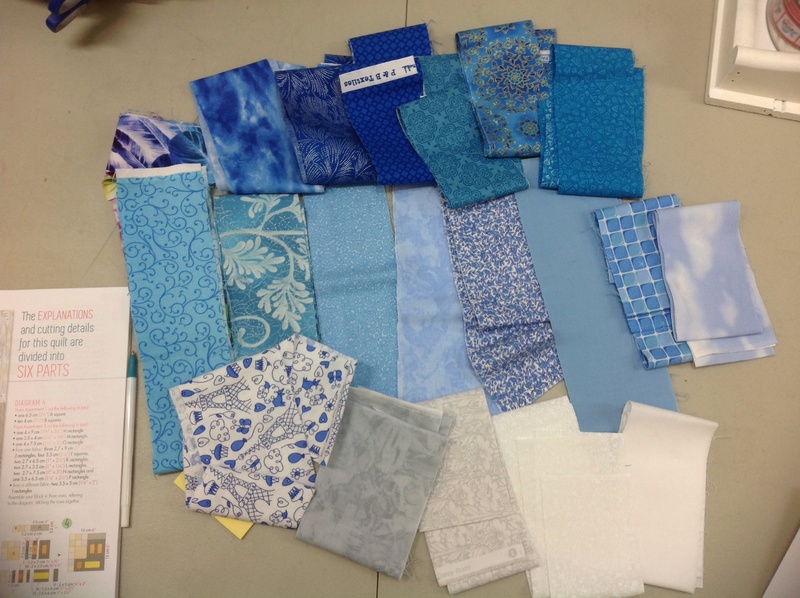 So far I managed to find twenty different fabrics for the sky, yes twenty! The original quilt has a cream-coloured sky, however, I wanted a little higher contrast. It took a couple of days to decide what look I wanted. Was it going to be a night sky of navy blues and black? What about shades of light blues? A real estate advertisement arrived in the mailbox showing the suburb at sunset – with a sky of pink, soft oranges and deep purples. It was a dilemma until I was driving home from the shops last week and saw the most wonderful winter sky – of the brightest blue with clouds that were so white. And so it was decided. I drew the design on paper and coloured it accordingly. It was then that I had to start cutting one inch squares – dozens of them! I sewed the first two rows of the first part and….it was dreadful. Trying to control the squares was difficult as they weren’t long enough to hold and I had to let them go when they went under the foot of the machine. I gave up at that point and slept on it. The answer was there in the morning – paper piecing (or foundation piecing if you prefer). The first two rows came together much better and then a few more. The above is only a small section of the first part of the project but I was quite satisfied with the results. The project is quite time-consuming but I think it will be quite pleasant. I’ll post more photos as we go along because others are using very different colours so it should be interesting. Let me know if you would like to do it too and we’ll talk skies. No time to see any more today because I was walking across the Story Bridge to commemorate the 75th anniversary. I walked the bridge with the children on the 50th anniversary so it is like a tradition now. How many people does it take to celebrate a bridge? Approximately 74,000 apparently. That’s how many walked the bridge today – and it did seem very crowded I must say. And hot. 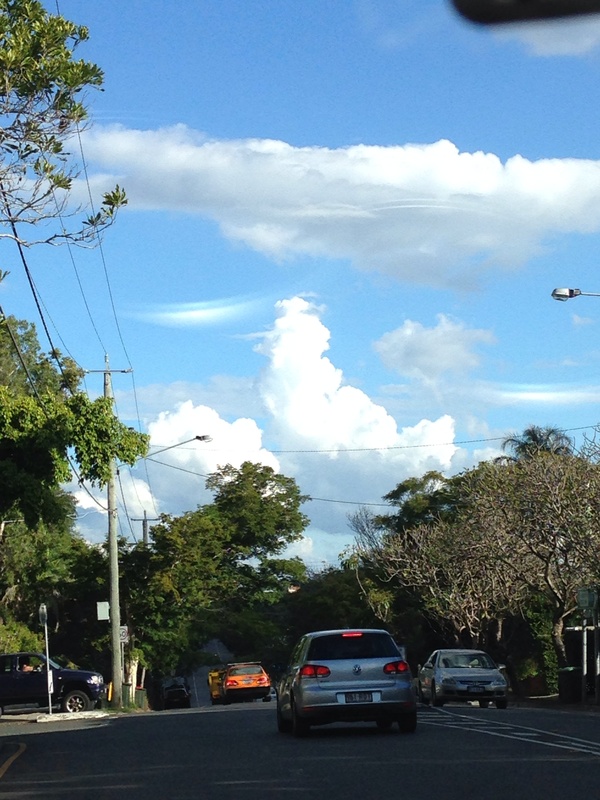 Winter in Brissie certainly isn’t cold, cold, cold. The Apatcheez didn’t disappoint this week. 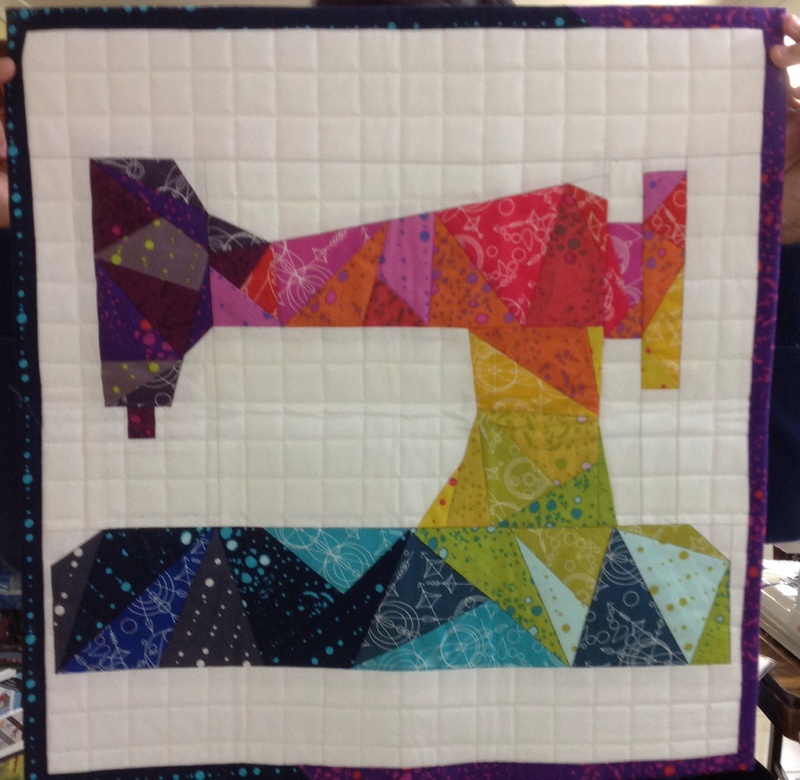 Sue finished her row-by-row quilt that have been on the UFO list for a while. 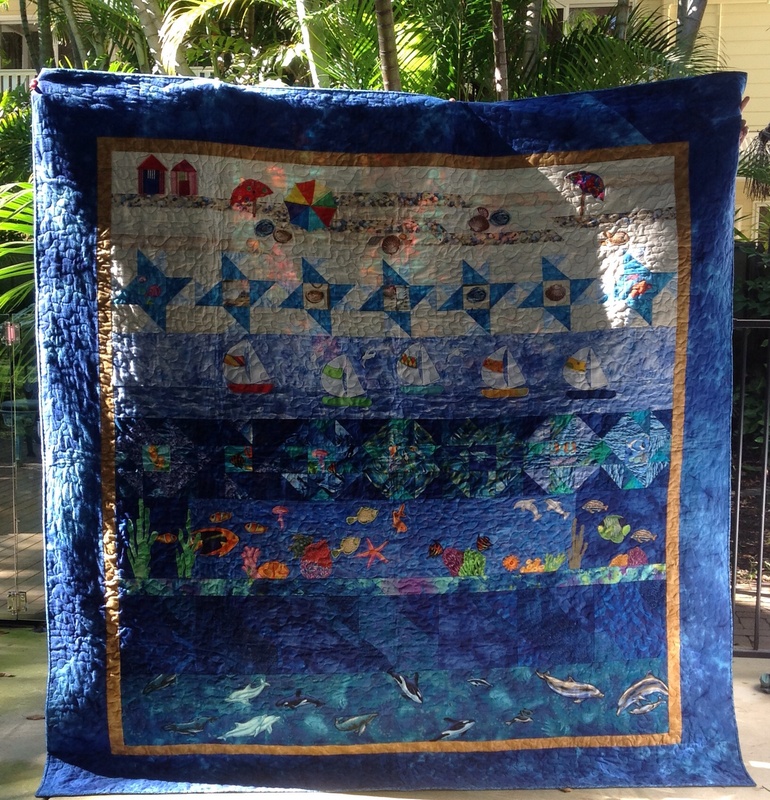 I think this pattern might be an inspiration to a few others who are keen to make an under-the-sea quilt because it turned out very well. Di has also had a UFO project on the go for a while and it is evolving into quite an amazing piece. 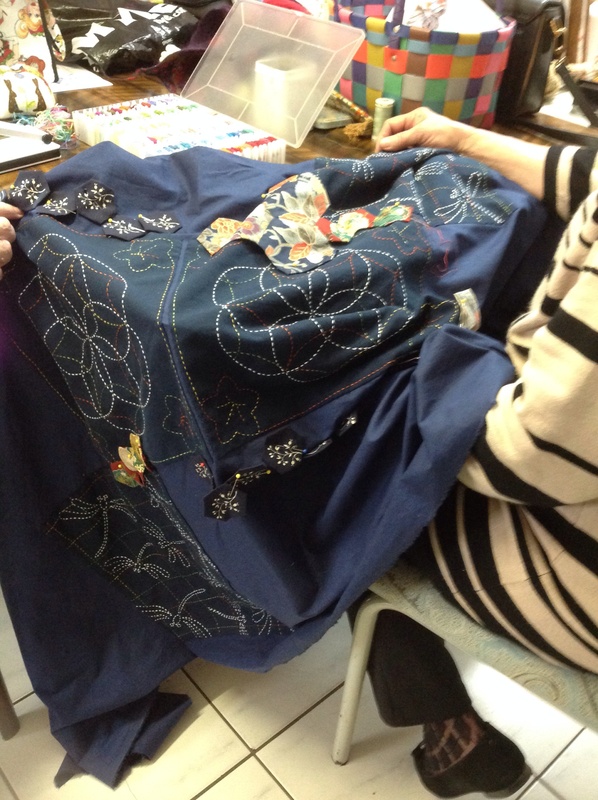 What started as a series of Sashiko samplers has become a much larger piece with appliquéd hexagons. We can’t wait to see this one finished. 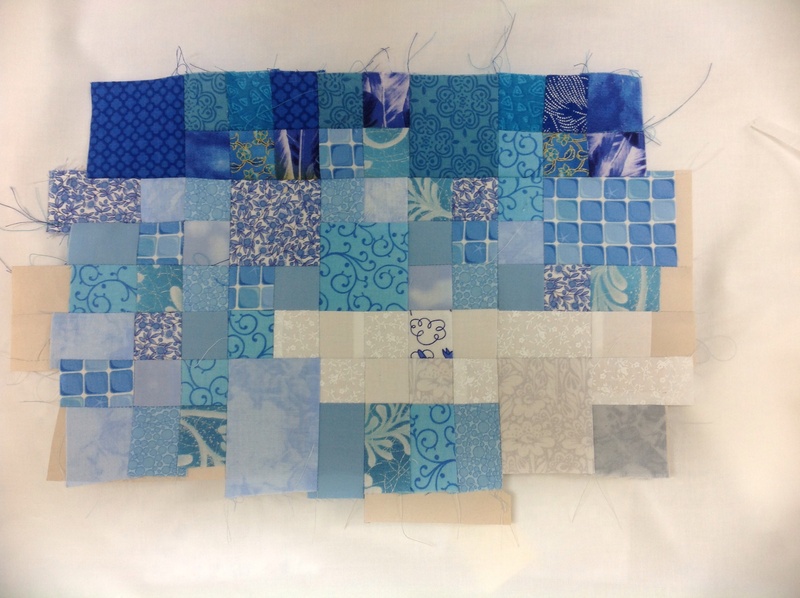 So lots of blue projects so far but not for long. The queen of colour, Bec brought a brilliant swap that she received that day. So I am looking forward to another inspirational week. Hope to see you and hear more ideas. Until then happy quilting.